This is a small project, a sample I made for Fons & Porter’s Love of Quilting Magazine while I worked as an Assistant Editor there. It was resized from a large wall-hanging, to demonstrate the difference between starting with 1″ squares, 3″ squares, or 5″ squares. The project was never published for whatever reason, so my sample just hung in my cubicle un-quilted, until I left there. ORIGINAL PURPOSE: See paragraph one. CURRENT STATE: It’s a finished block/top, it’s about 12″ square, give or take. REASON FOR NOT FINISHING IT: What am I going to do with it? I suppose I could add another border or something to make it a table topper and give it away. It could be a pillow, one of my niece or nephews might like it. Any suggestions?!? PLAN FOR FINISHING IT: Decide who’s suggestion I like best and get it done. It will be an easy one to cross off my list! 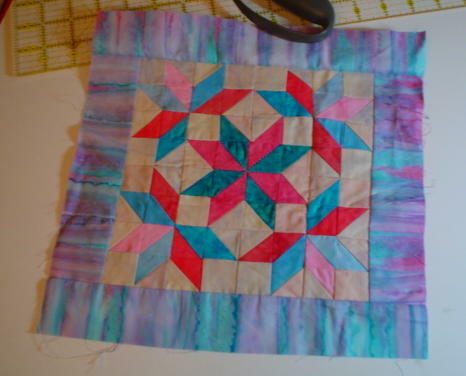 why not join a little quilt swap ….or send it to me…LOL…..the Fons and Porter mag is my favourite! I love the detail in the projects they present….